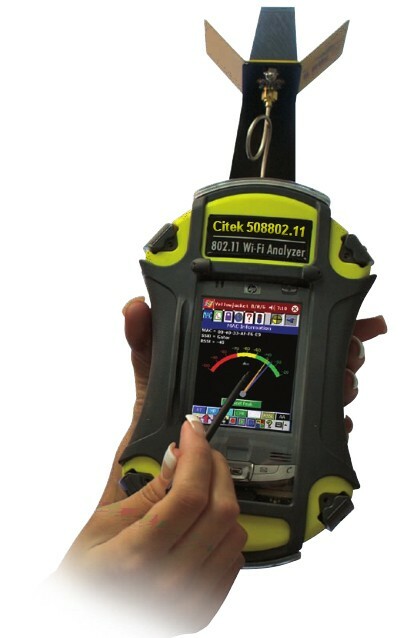 Citek 508802.11 is a handheld, wireless test receiver system that demodulates, sweeps, analyzes, and optimizes all popular 802.11 Wi-Fi network standards including 802.11b/g (2.4 GHz), 802.11n, and even 802.11a 5 GHz). The calibrated receiver is a passive measurement device that is network independent so it remains “invisible” to any 802.11 Wi-Fi network. Citek 508802.11 is also a powerful spectrum analyzer that measures RF energy (2.0-4.0 & 4.9-5.9 GHz) allowing not only detailed interference analysis but the ability to see the “whole picture” of your 2.4 and 5 GHz network WISP or hotspot. When equipped with a BVS DF (Direction Finding) antenna,Citek 508802.11 locates and pinpoints rogue APs and STAs and even detects interference from sources such as microwave ovens and cordless phones. Powerful packet analysis features such as Multipath (Ec/Io), SNR (Signal-to-Noise Ratio), Delay Spread, Channel Frequency Response (CFR), SSID and Received Signal Strength Indicator (RSSI) give Citek 508802.11 the distinction of being the only true handheld RF spectrum protocol analysis and direction finding tool accurate to within +1 dB.Citek 508802.11 functions as a complete WLAN analysis system offering both measurements made through packet demodulation and spectrum analysis in a rugged, handheld package.